2008: A Year in Review | This is our life. After looking at some of the journaling I’ve done in preparation for making scrapbook pages, I’ve come to realize that 2008 has been a very busy year. I’ve branched out in a lot of areas and lots of life-changing things have happened, too. 1. Mini-Marathon. 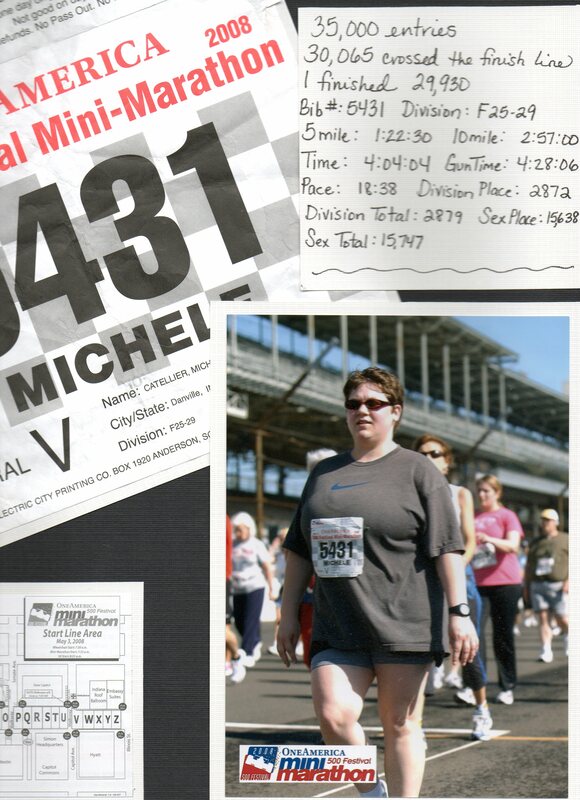 In May I participated in my first Indianapolis Mini-Marathon. This is something I had always wanted to do ever since my cross country days at North Putnam High School. But like a lot of things, it was just one more thing that I didn’t get around to doing. I had shed some pounds earlier in the year and had high hopes of training to run it, but it didn’t turn out that way. The truth is that I barely even prepared myself by going on long walks in the neighborhood. Something always seemed to come up and I was pretty nervous about going through with it. I considered selling my entry on ebay rather than humiliating myself by not being able to finish. But I chose to go anyway and walk it. I finished, but at about mile 10, I thought I was just going to die. Okay, maybe not die but definitely collapse. I shuffled across the finish line four hours after the start of the race and as much as I wanted to just lay down and veg out, I had to drive myself home. I had friends and family offer to come downtown to cheer me on, but I told them it wasn’t that big of a deal. I kind of thought I needed to do this all by myself; to remind myself that I can do something if I really put my mind to it. When I got home that day, I got online and signed up for the 2009 Mini. Minus all the blisters and muscle cramps, it was a wonderful day and I can say I’m proud of myself for trying something new. 2. Mary Kay. I became a Consultant over a year ago and have had a lot of fun with it. And even though I’m not as proactive at selling like I was last year, I still truly enjoy it. I’ve used my business for some good in the community, raising money for the local abused women and children’s shelter. Fortunately, the shelter was available to a dear friend of mine that needed emergency housing for her young daughter and herself. They do great things for the people of this community and it gives me warm fuzzies to be able to send them my commission check once a year. I also am thankful to have found Mary Kay because it’s tremendously helped me in my fear of social situations. A few years ago, I’d get what I consider panic attacks when I had to socialize with people I didn’t know. I guess looking back, I was afraid of them judging me for some reason. But I’ve become much more confident speaking with strangers since venturing into this business, and for that I’m thankful. 3. Religion. I have to admit that in recent years I’ve been very cynical about whether God even existed. Not in the “if God exists, why does he let bad things happen?” sense, but in the sense of “when we die, we die. The End.” But this year I’ve been trying to find out more about God and what he means to me and my family. I realized my four year-old knew more about God than I did (from going to Mass with my in-laws). That was pretty sad! I began attending RCIA classes at a nearby Catholic Church. While there are still a few things I’m having a hard time grasping about the Religion, I’m really enjoying the process. My girls and I will be baptized at Easter Vigil and my marriage to Jeff will be officially blessed by the Church. I’m excited to be a part of the church community. 4. Hendricks County Fair. This summer I participated in the Open Class competition at the local fair. I submitted a scrapbook of my in-laws’ Mediterranean cruise that I had made for them, along with a terra cotta snowman that I made for a local craft fair. I earned two first-place ribbons, which I was very excited about. (Although I have to say that the Grand Champion scrapbook looked like an old-school Creative Memories album, circa 1998, which I was completely not impressed with!) I can’t believe it won Grand Champion. Their Grandmother probably was the judge. lol. 5. Daycare. About two years ago I started a small, in-home daycare to help out with some bills and break up the monotony of being a stay-at-home Mommy. Well, in February 2008 I decided to significantly downsize since it seemed like I wasn’t enjoying it as much as I once did. I felt like I was ignoring my own children in a sense, to watch after other people’s children. After sitting down for a long time with lists of pros and cons, I decided it was in everyone’s best interest if I just continued to take care of one little boy along with my two girls. Life is good now; I am so happy with the way things are going. I guess I had to learn the hard way that I’m not cut out to watch 6 or 7 high-energy kids all at once. It makes me tired just thinking back to it all! lol. 6. My Life Minus a Stepmom. My dad’s divorce from my stepmom became final in 2008, over four years from when they first separated. Life is better for me and my family now. For those of you that know the situation, that’s no news to you. For those who don’t, let’s just say we all wish it happened 18 years sooner than it did. ‘Nuff said. My mom at Christmas 2008. 7. My Mom Became a Widow. My stepdad passed away in October and although I feel like Mom is moving on really well, I still feel bad for her. She’s having to manage a household, dogs, bills, car repairs, furnace issues, being snowed-in,and everything that goes with living in the woods all on her own now (not to mention he had no life insurance). And while my stepdad and I had a bad relationship to say the least, I was sad to hear that he suffered so much in his last few weeks on Earth. Because of the more than likely cancer diagnosis, they were not able to procure any organs, other than his corneas. Mom is proud that his eyes will help someone else see. Weird emoticon thingy at the end of that…that’s not what it looked like on my end!